Some mornings I don’t feel like eating my favourite breakfast: eggs. 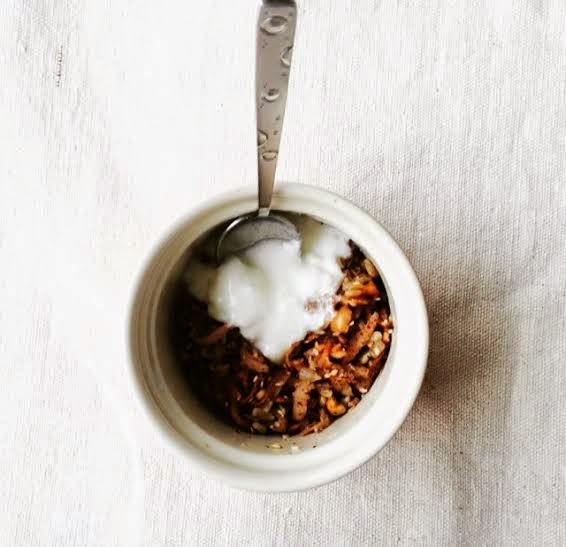 Before, I would simply get a package of store muesli from the kitchen drawer and eat it with some yoghurt. Now I am making it myself. I don’t like oats, and I agree with all my heart -and sniggering- with Dr. Karatay who calls it horse food. I think oats are dry and lead to unnecessary carb consumption. They also have a rather high glysemic load. When you are looking at the glycemic index chart, never forget to check the glycemic load. You will come to realize that a lot of foods with normal glycemic index have incredibly high glycemic loads ! Put peanuts and walnuts to a food processor and make sure they stay in large pieces. Add sesame and sunflower seeds, grated apple and cinnamon and stir. Pour the mixture into a baking pan. Add small pieces of butter on top. Bake until golden in a pre-heated 180C oven. Serve slightly warm and with yoghurt.